My family thinks they love eggnog. I mean, starting this time of year, they say “don’t forget to buy eggnog.” And then I buy 3 quarts of it and it sits there….for the entire month. Apparently I am the only TRUE eggnog lover in the house. My kids love the tradition of eggnog. We pour ourselves a glass every Christmas Eve, before opening presents to each other, and reading the Night Before Christmas. Even that night, I find half full glasses of eggnog on the table after they have all lumbered up the stairs for bed. As the TRUE eggnog lover, I guzzle every last sip, backwash and all. Because I know it won’t be long before it disappears from the grocery store and I’ll be left waiting 11 months to enjoy it again! One thing I love to do with all the eggnog I buy is make treats. Everyone loves eggnog flavored food, haha. Including these eggnog donuts, or eggnog cheesecake bars. YUM. 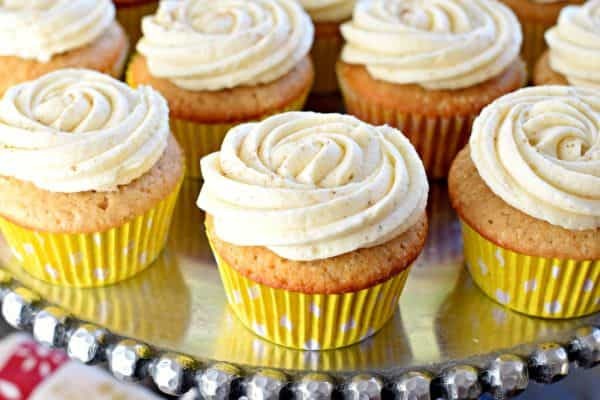 Today, I’ve made Eggnog Cupcakes. 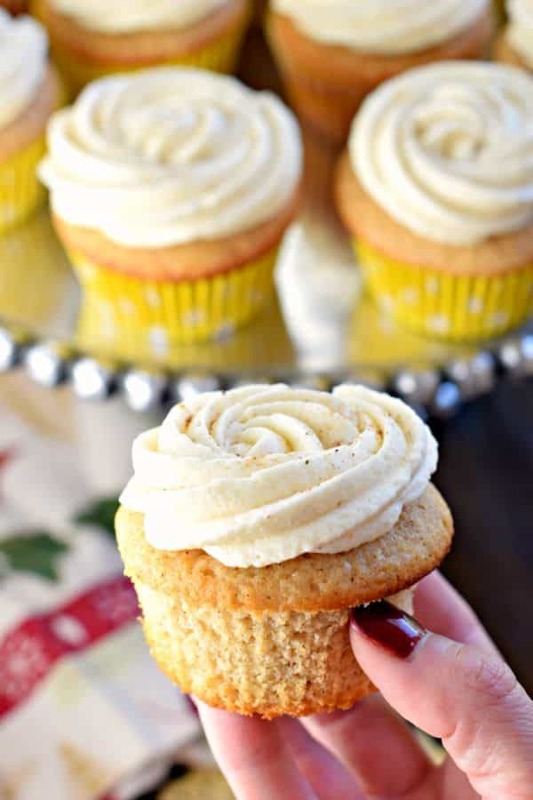 Using my favorite homemade spice cake recipe, I topped these cupcakes with a sweet, creamy Eggnog Frosting! So good you guys. So tell me, do you have a love or hate for eggnog? And, have you ever made your own? I haven’t done that yet…. Bake in a 350 degree oven for 18-20 minutes. Remove and cool completely before frosting. Pipe onto cupcakes using your favorite decorator tip. Add a sprinkle of nutmeg if desired! ENJOY. Oh, how I love eggnog!!! And lucky for me, the boys love it too, so I am not the only one guzzling cups of calories all month long. LOL! 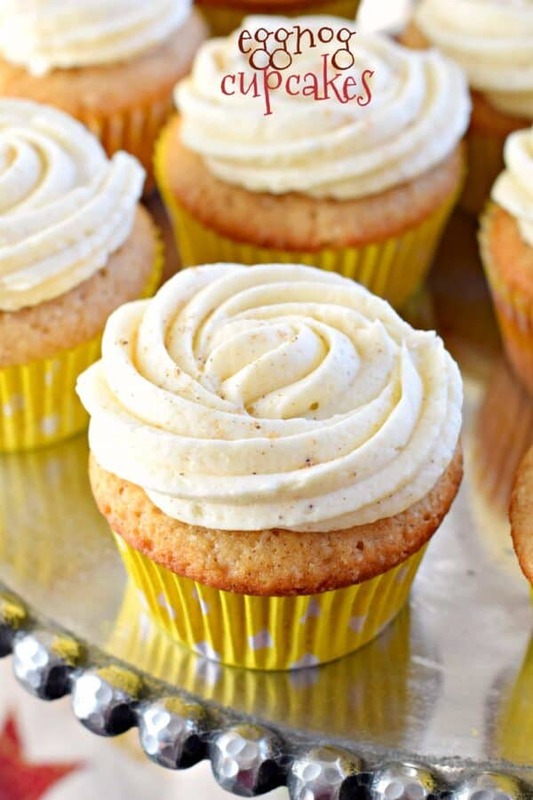 I love that you tweaked your spice cake and used eggnog! They look so good!!! LOVE egg nog!!! I grew up with a homemade recipe and it was just a couple years a go that I tried the store bought stuff for the first time. I still prefer the homemade, but won’t say no to the store bought stuff! I bet these are delicious. I have tasted store bought eggnog, but not really drank it. I make boil custard and add rum extract with nutmeg on top. It sure is good. Always vote for egg nog! This is great ! Thank you! These sound awesome. I don’t like to drink eggnog, but I do love the taste. I think its the nutmeg I like. 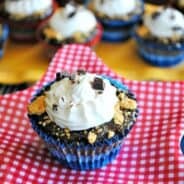 These would be good to have on the dessert table for Christmas. Thanks for sharing. PERFECT! 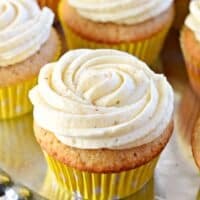 I love the creamy, custardy flavor that eggnog imparts on baked goods. I think I like it better as an ingredient than as a stand-alone drink!! These look perfect. I am with Charlotte. Boiled Custard was our Family Tradition. LOVE Boiled Custard! Eggnog is OK. My husband and Australian Shepherd are CRAZY about Eggnog though. I buy Eggnog for them. I have friends who make homemade Eggnog, but they put too much liquor in it. I will have to make home-made nog – it doesn’t exist in NZ and I’m super jealous – anyone who has a good recipe I would love to give it a go! 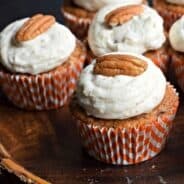 Could this be made with the spice cake box mix? which cake tip did you use? 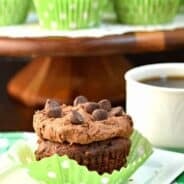 What is cup cake flour? Do you mean cake box mix? She was saying to put in 2 and a half cups of cake flour in. I usually use Swan’s Down brand. Nope, cake flour is a type of flour. You can find it in the grocery store near the other containers of flour….I use King Arthur Cake Flour.